The fall of the Berlin Wall twenty years ago heralded a new era, a Golden Age of capitalism. Communism was dead, the Cold War was over and years of peace and prosperity lay ahead. At least that’s what workers were told at the time. When Gorbachev embarked on the road of Perestroika and Glasnost in the ‘80’s, little did he realize where it would end. The collapse of the Russian bloc was unprecedented; never before had an imperialist power simply imploded. The global economic crisis which took hold in the seventies had hit the Russian bloc particularly hard, and unlike the West, the rigid economies of the East had no creative tricks up their collective sleeves. When the crisis hit, Russia tried to export the worst effects to its satellite states, but nothing worked. The shortage of basic goods was the most serious since the Second World War, and rising inflation, growing unemployment and an ever dropping standard of living led the Russian state to try to open up in a controlled way to a free market, but instead of being able to control the changes it collapsed under their weight. 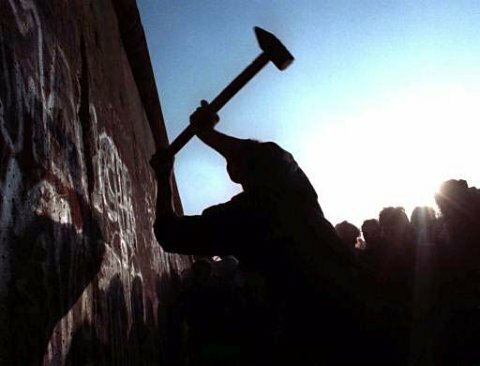 The Wall itself had been a product of the weakness of the East German economy. By the time it was built in 1961, some three million East Germans had already escaped to the West. In the months before the Wall went up, they were leaving in their thousands each week. It was impossible to keep the economy going with this level of defection. Schools would find teachers missing, hospitals worked suddenly without doctors, factories without workers. Apart from the bruising image such defections left, on a practical level losing this many people proved a headache for the East German state. The borders between East and West Germany had already been closed, leaving Berlin as the only escape route. So they built a wall, starting in the middle of the night in August 1961. It is estimated that during the course of its existence, some 5,000 people successfully escaped to the West, but the estimated numbers of those who died trying range from 136 to 200. At the time of its collapse politicians publicly made the most of the death of the old enemy and queued up to support the new era of freedom. Behind the scenes though, things weren’t always as enthusiastic. Thatcher had met with Gorbachev to try and persuade him not to let the Wall fall. She and Mitterrand feared a united Germany, and when Jacques Attali, personal adviser to Mitterrand, met a senior Gorbachev aide in Kiev he reported that Moscow’s refusal to intervene in East Germany had ‘puzzled the French leadership’ and led to ‘a fear approaching panic’. Five months after the Wall came down Mr Attali said the spectre of reunification was causing nightmares among France’s politicians and he told Mitterrand he would ‘fly off to live on Mars’ if it happened. As far as we know he hasn’t actually managed to do so. However the bourgeoisie’s fears of what the new world order might bring were partly justified. The era of peace the Wall’s destruction was meant to herald was extremely short lived. Just as nature abhors a vacuum, so too does imperialism, and a year later we had the first Gulf War and two years after that a barbaric bloodbath as the former Yugoslavia tore itself apart with a little help from the big powers jostling for supremacy. The era of democratic freedom in Russia was also short lived; the rise of the oligarch billionaires (who made their fortunes plundering natural resources and cashing in on the international finance markets) quickly led to growing inequality, increasing poverty and violence as the consolidation of this new gangster class (albeit containing some of the old gangsters of the pre-’89 era) took place. Democracy in Russia now means the state making decisions for the benefit of fifty or so people. However, all this is glossed over in the anniversary celebrations and twenty years on the international bourgeoisie and it’s commentators are again, in their droves, repeating the old propaganda that Russia and the East were communist and that communism was oppressive, (consisting of the salt mines and the Stasi) or equally that it was utopian and impossible, but in any case dead. In reality the Russian bloc was as far from communism as you could get. Its economy, as in the West, ran on the exploitation of the working class and the accumulation of capital; where wage labour exists, so too does capitalism. The goods they produced were not for the satisfaction of social needs but for the needs of capital, and for the wealthy apparatchiks at the head of the state. The East, however, had developed centrally planned state capitalism, and this contributed to its weakness. Its form came from historical conditions, as a result of the defeat of the Russian Revolution, or more specifically as a result of the impossibility of an isolated revolution continuing to exist. The Russian state turned to managing the relations of production as a ‘collective’ capitalist and state capitalism was born. Since the bourgeoisie can no longer bombard the working class with the daily propaganda that Russia equals communism, it has to make the most of anniversaries like this, dredging up old propaganda and never letting reality get in the way. It may be true that all walls are equal, but it would seem that some walls are more equal than others. There are currently thirteen walls existing in the world separating people from each other, notably Botswana-Zimbabwe, India-Pakistan, Mexico-US, and the West Bank, approved by the Israeli government in 2002 and two thirds built, despite the fact it was deemed illegal by the International Court of Justice in The Hague. All of them are symbols of the war, poverty, oppression and exploitation that capitalism dishes up to the working class on a daily basis. An alternative to capitalism is possible, but communism has nothing to do with the rotten state capitalism of bygone years in Eastern Europe. Communism is a society of freely associated producers where wage labour and exploitation will be a thing of the past, where the horrors of capitalism will be consigned to history, along with Stalinism and its ideological walls.